is an elite crew of first and second graders. His son, Michael, is a first grader on the Space Shrimpies team. 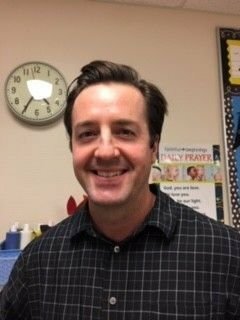 Mr. Ramsey and his family are parishioners at St. Vincent de Paul, and his wife Annie home schools Michael and his three year old brother, Jack. He really enjoys tinkering with electronics and mechanical projects, playing with Legos, swimming, and riding his bike on the many trails of the Northwest Metro. Mr. Ramsey also likes playing sports with his boys. In the winter, Mr. Ramsey has been known to spend a lot of time in the snow and build snow forts. "It has been fun seeing the Space Shrimpies come up with ideas to solve the many challenges involved with building a base on the moon. They are working well as a team and are quite proficient at building and programming their robotic creations. I'm thankful for the opportunity to participate in this fantastic program. Go Space Shrimpies!"